Hey, friends! I was tagged by Julia over at Penny Pinching Perfection to do this tag. If you haven't checked out her blog, you should. She's the one that got me into Swagbucks and a bunch of other alternative money-making websites. She knows her stuff! 1. Would you rather lose all your mascaras, eyeliners, lipsticks and lip glosses or lose all of your palettes and eyeshadows? - I'll have to pick the second one, because I can still do a full face of makeup with the former, but not with only eyeshadow. Mascara is the one item I feel that makes the biggest difference, since it really helps my eyes stand out. I'd feel weird wearing eyeshadow without mascara! 2. Would you rather chop off all your hair or never be able to cut it again? - I'd rather never be able to cut it again. My hair has almost always been very long, except for the time where I chopped off 14 inches in the 8th grade. I just really enjoy having long hair, even if it is a hassle sometimes. 3. Would you rather have a coral cheek or a pink cheek? - Since I tend to associate coral cheeks with summer, I'm going to have to say pink. Pink cheeks are year-round! 4. If you had £1000 to spend, would you rather buy clothes or makeup? - Clothing! All makeup products run out eventually, but if you buy good-quality, classic pieces they will last a long time. Plus, if you get them tailored to your body, you'll look like a super star. There are some great drugstore-priced makeup products out there, but a lot of the cheap clothing stores I shop at use thin materials, and I'd love to have the money to branch out and shop in stores like Ann Taylor, BCBG, and other expensive stores more often. 5. Would you rather apply lipstick as eyeliner or eyeliner as lipstick? - I'm going to have to say eyeliner as lipstick, simply because I wouldn't want to irritate my eyes. Maybe I can buy a berry-colored one. 6. Would you rather only shop at MAC or Sephora? - Sephora! As much as I love MAC, Sephora has more variety. And Urban Decay (Julia and I agree on this one). 8. Would you rather wear winter clothes in the summer or summer clothes in winter? - Summer clothes in the winter, I guess, because that way I can at least use a blanket if I'm at home! Although I'm always cold, I hate being too hot, so it's really a toss up. 9. Would you rather have dark nails or bright nails all year round? - I associate dark nails with winter, so I'll have to say bright nails. They always put me in a good mood! 10. Would you rather give up your favorite lip product or your favorite eye product? - I'm going to have to say eye product, simply because I wouldn't make it through life without lip balm. 11. Would you rather only be able to wear your hair in a ponytail or a messy bun? 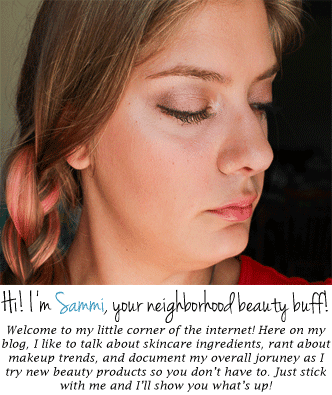 - My hair lives in a ponytail, so this is a no-brainer! 12. Would you rather never be able to paint your nails again or never use lip gloss? - I have this kind of pet-peeve where my toe nails have to be painted if I want to wear sandals or other toe-exposing shoes, so unfortunately I'll have to give up lip gloss. I just won't be able to stand it if my feet look gross!